After reading this page, Rick Webber, UK sent me the following email. Many thanks to Richard Webber for sharing. Many years ago (2002) I was making and selling many SPAD aircraft kits and I had very little success with flashing and CA which was the recommended method at that time. My solution was to contact an adhesive manufacturer in my local city and challenged them to bond some sample corex that I sent them. Within two weeks they returned me a sample bottle of a CA they code named SF100 (Now available from 3M), along with my corex samples well and truly bonded, in fact one of the planes made back then with SF-100 is still flying today without any problems. I, like you test the bonds to destruction and in all cases the corex surface was ripped to shreds with large chunks still bonded to the other test part. The method used to create such a strong and lasting joint only requires the corex, (both parts), to be cleaned with methylated spirit and allowed to evaporate prior to putting spots of adhesive every half to three quarter inch onto one surface, place the two surfaces together and apply even pressure along the length of the join. I am aware that 3m Scotch-Weld SF-100 is not a cheep adhesive but it really does the job as long as it is fresh and stored at low temperature out of direct sunlight. In this experiment I tested 6 different materials to see how well they glue polypropylene corrugated plastic sheets often known as polypropylene. polypropylene is a specific brand name. For more companies that make this material see my corrugated plastic page. In this test I prepared 6 samples of 4 mm corrugated plastic. I used a sheet which I had tested to see if water beaded on it indicating that it had not been treated by heat flash or corona process. Untreated Polypropylene is notoriously difficult to glue while treated surfaces show better adhesion. My sample had been treated. CA Glue ie Grazy Glue, Superglue, cyanoacrylate. This brand is a low end brand from the hardware store. High end CA glue by Loctite 406 is reported as a good glue for this but I wanted to check out a lower end and much less expensive glue. Contact Cement, from the hardware store. 3M Specialized Hot Melt Glue. This glue gets very hot. Regular hot melt glue sold for more demanding applications. The temperature is in between the 2 grades. Craft grade hot melt glue which actually melts at quite a low temperature. The CA glue was applied to one side sparingly and the 2 pieces pressed tightly together. The contact cement was applied to both pieces and allowed to dry. The pieces were then pressed tightly together. The 3 hot glues were allowed to warm up and were applied to both pieces. I rubbed the glue gun nozzle against the plastic sheets as I applied it so that they would warm up some. PL Premium was rubbed on both sides using a stick. This was pressed together and allowed to dry for several hours. I had set some aside on a separate piece to see how long it took to dry. After several hours I checked my samples. 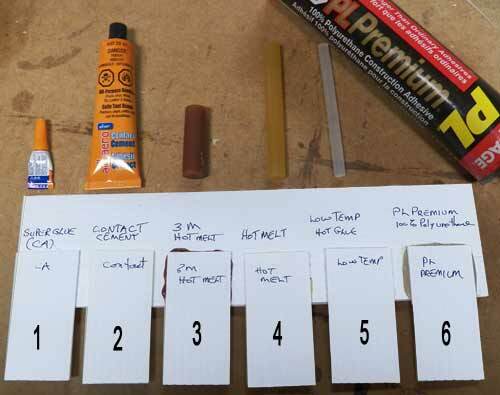 The test PL was set and the other glues are short set glues. My testing plan was to try and pull the samples apart. If the bond was strong I planned to pull to destruction. The cheap cyanoacrylate (super glue) made a strong glue bond which would not come apart after energetic pulling. I eventually managed to separate the 2 pieces by twisting them apart. I found that only about half of the sample was glued. The rest was still wet. I think I had put too much glue to start. Impressive result from a smaller area. Contact cement glued but was relatively easy to remove. I would call this a suitable tacking bond if I was planning to sew or wire the sections as well as glue. Good for positioning. It would stay together if no stress was placed on the bond. 3M Specialized Hot Melt Glue stuck absolutely and I was not able to remove the pieces. The polypropylene tore rather than let go. After a week I was able to tear the 2 pieces apart but some of the plastic was torn. Hot melt glue came off after a hard pull. It worked but not well. It came off equally well from both surface with bits of glue left on both surfaces. Craft grade lower melt glue was much harder to remove than the so called heavy duty medium heat glue. Also most of the glue was left on one side showing that application method had an impact. I was able to eventually remove it but it took some force to peel it off. Polyurethane construction Adhesive. Lepage's Premium PL did not hold at all and peeled off. I checked the piece I had kept aside and it also flaked off with no effort required. My grand prize winner is the 3M hot glue designed for Olefin plastics. Second prize but almost equal is the Cyanoacrylate glue. A tiny corner had me pulling very hard to take it apart. I don't think I would use the cheap brand but good quality CA glue will work even better. I guess the Loctite 406 with its higher price is the one to choose. In third place contact cement works for a low strength bond. P.S. I repeated the Cyanoacrylate glue test using less glue and very lightly sanding the surface to add some bite. I was hoping to make it work. Results were the same. Respectable bond but it could be pulled apart. I guess you get what you pay for with crazy glue. NOTE: Although I did not test it personally, 3M Scotch-Weld SF-100 has been reported as completely successful, see letter at top of page. Amazon.com can supply it, I have a link on the side links. It is pricey and it works. Many people are playing with polypropylene building boats. It's important to be able to trust any glue used. Ben Krasnow's blog has an interesting post about gluing polypropylene using 3M Scotch-Weld DP-8005. He reports total success but the material is a bit pricey at 28 for 35 ml. 3M DP8005 polyolefin adhesive information. NOTE: This is a series of informal experiment I did. I cannot guarantee that all corrugated plastic will glue in this way. Do your own test before trusting any adhesive. 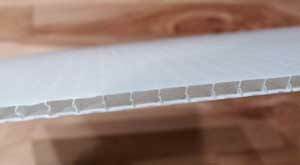 Some corrugated plastic sheets are surface treated to improve adhesion. At this point I don't think there is any glue that works perfectly and reliably all the time. If there is any stress on the bond use a secondary fastener like a wire stitch or one of the high end tapes. My best success was with special hot glue formulated by 3M specifically for olefins plastics. After a day I cannot tear the sample off. It has the advantage of being relatively inexpensive. My second best glue is CA glue. I used a cheap version and had surprisingly good stick. Loctite among others offers better formulated versions including their 406 which are quite successful but expensive. I have started building a polypropylene Boat. I made a model first. I have the materials and have started building. One way to improve adhesion of glues and paints on polypropylene is to flash treat it. This just means that you run the flame of a torch on the surface that is going to be glued. This process changes the energy of the surface and makes it more receptive. Since PP melts at around 170 Celsius it has to be a QUICK pass of the flame. Practice with a waste piece first! TechBond have CA glues that work for Polypropylene. Someone Else's test on Glues He found Loctite to be the winner. This is a trade name for Corrugated plastic sheet made in many colours and thicknesses. polypropylene is a US company. In other parts of the world other trade names might be better known. Examples are Plaskolite, Corplast, Coroboard, Corruboard, Polyflute, Intepro, Correx, Twinplast, Impraboard, Alylux are other trade names. If you are looking for a local supplier Googling these alternatives might be helpful.